Thinking about a Japanese maple for your garden? Find out about the characteristics of one of the most popular bloodgood Japanese maple. The Japanese maple is a wonderful breed of tree that has a broad spectrum of varieties. Amongst the many different kinds of trees that are classified under the umbrella of Japanese maples is the Bloodgood Japanese maple. This particular Japanese maple tree has a round shape. The size of the tree makes it ideal for use in residential landscapes as it can expand over a height and spread out over twenty feet. The unique thing about the Bloodgood Japanese maple that makes it a popular choice are its red leaves that retain their colour for most of the summer season. The otherwise red leaves start to turn greenish red when temperatures begins to soar. The tree stands upon multiple trunks that have quite a muscular chiselled look. 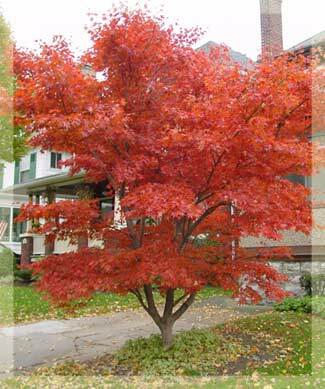 The Bloodgood maple is a picturesque tree and gives off a grey tint. The tree can work wonders when nicely lit up after nightfall. The red colour of the leaves in the winter season is less striking than the colours of summer. Nonetheless the bloodgood Japanese maple retains its beauty throughout the year. The shape of the bloodgood tree is like a globe and it looks its best when its branches extend all the way to ground. To add to the aesthetics you may prune the foliage on the lower end of the branches as this would expose the artistic trunk structure. The Japanese bloodgood maple tree is classified as a shrub and can be planted on a patio, as a bonsai or an above ground planter in a standard manner. It has a hardiness range and is easily available in many areas. The average bloogood maple can shoot to a height of up to 20 feet and an equally wide spread. The rounded growth of the tree is balanced by a symmetrical habit that has smooth outlines and each tree looks almost identical. The bloodgood maple has a relatively slow growth rate as it takes its time to come into its own. The leaves are classified as relatively simple, serrated and parted. The tree requires a constant supply of water and is counted amongst deciduous trees. This is one of the reasons it is usually planted close to the pond or other water features within gardens. The leaf colour can go from red to purple displaying a great show. The Japanese bloodgood maple sprouts red flowers during the spring season along with an elongated fruit. The bloodgood stands upon multiple trunks and clumping stems. The entire tree is thornless and the thin twigs tend to take on a reddish tint. The nature of this plant is such that it can grow in the shade as well as the in the sun. In terms of its soil tolerance the bloodgood maple has the potential to withstand alkaline, acidic, loam clay and sand in moderate intensity. The roots of the tree seldom create any problems. The tree looks amazing in the winter season because of the fruits and flowers that blossom in the cold season. This beautiful tree is also known to possess a strong immune system making it less vulnerable to succumb to disease and pests.